The late Gothic and English revival structure entered the National Register of Historic Places in November 1978. The above material is based in large part on the publication entitled Heart, Mind, and Spirit. 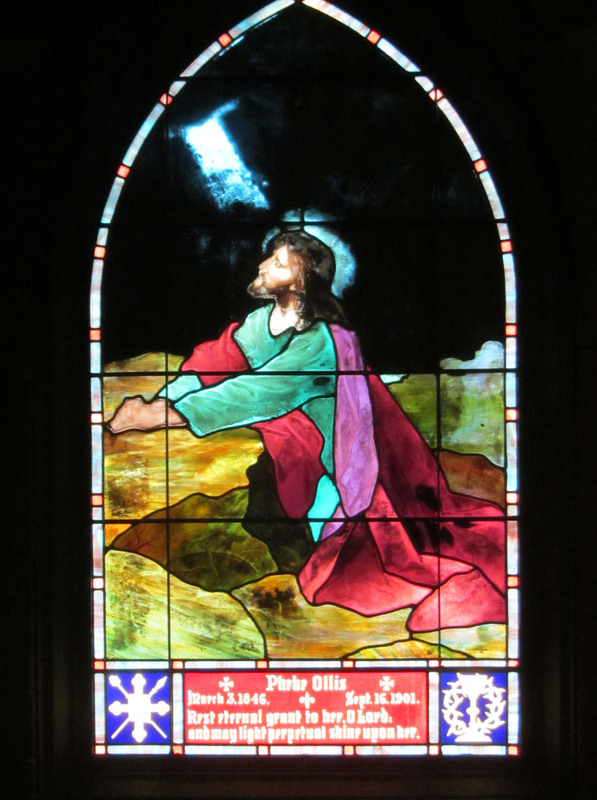 Nearly all of the church’s painted-art-glass windows were designed by Thomas Pain and fabricated in Kansas City. Created in memory of Thomas John Brooks Pain (d.1881) father of Thomas John Bowyer Pain. 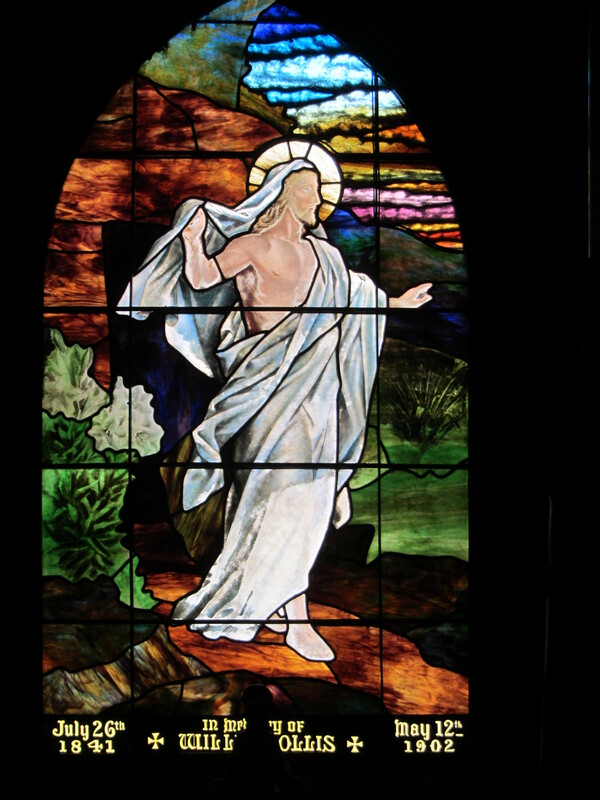 .The Angel with Incense window was given in memory of Thomas John Bowyer Pain’s daughter, Lilian Vera, who died aged six in 1889. 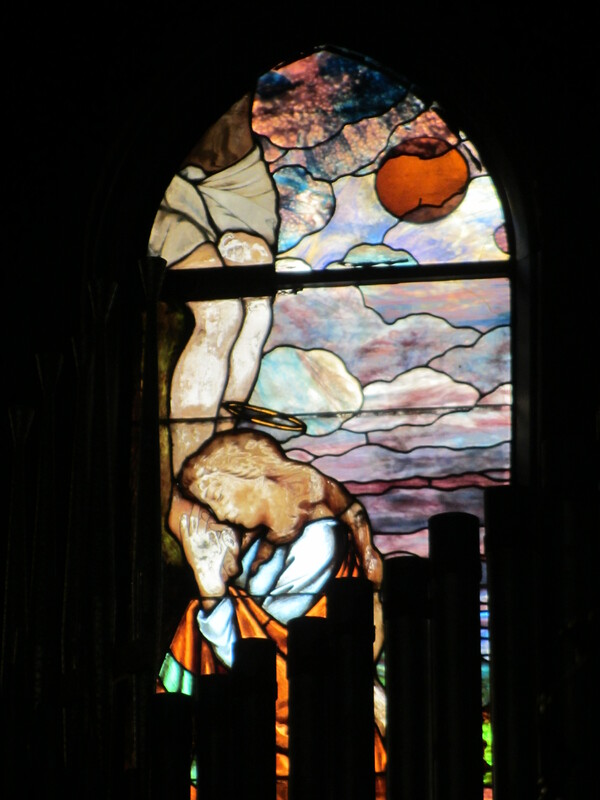 Given in 1906 by Reverend James Stewert-Smith, Rector of St Mary’s from 1891-1915. 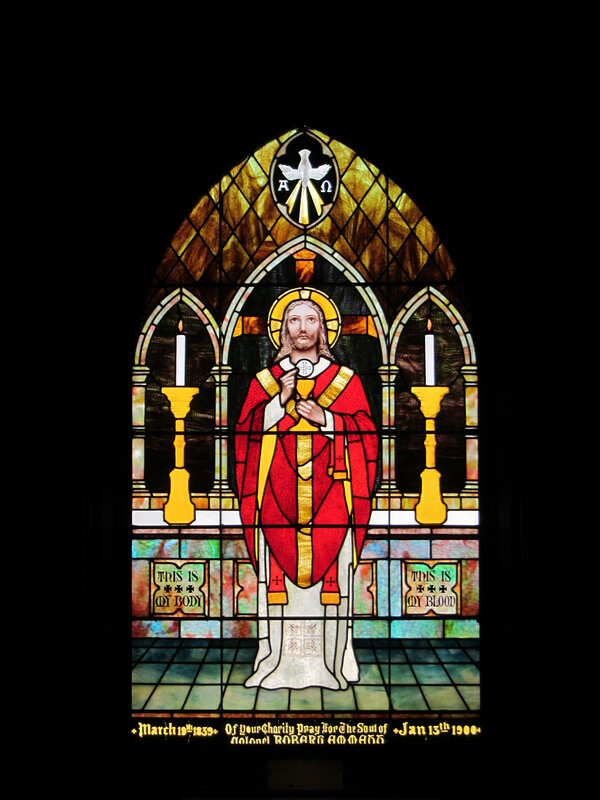 Given by St. Mary’s guild in 1908 to commemorate the 30th anniversary of Father Stewert-Smith’s ordination into the priesthood. St. Augustine ( ) was the first to hold the title of Archbishop of Canterbury. 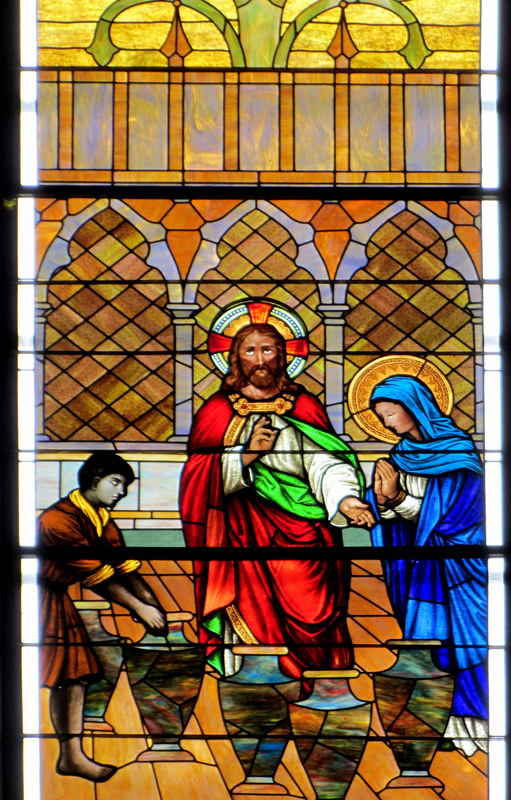 St Margaret ( ) encouraged a greater level of religious piety in Scotland. St. Athanasius was the 4th century bishop of Alexandria. 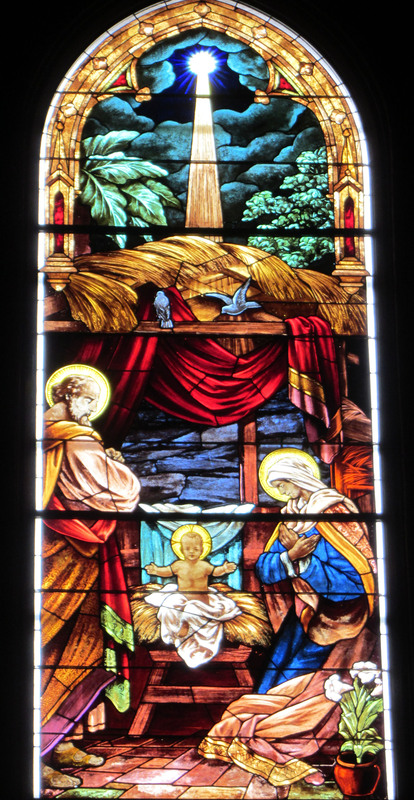 On the banner “of one being with the Father” is from the Nicene Creed. Given in memory of Mary McFarlane Ferguson. 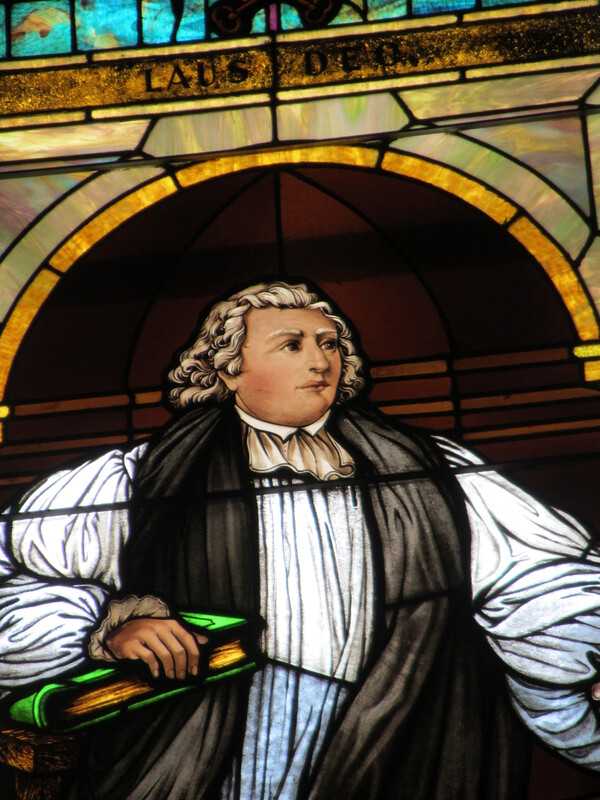 At the end of the Revolutionary War, Reverend Samuel Seabury was instrumental in organizing the Episcopal Church of the United States. Given by St Mary’s Guild in memory of the Reverend John Sword 9d.1911) Rector of St. Mary’s from 1886-1891. 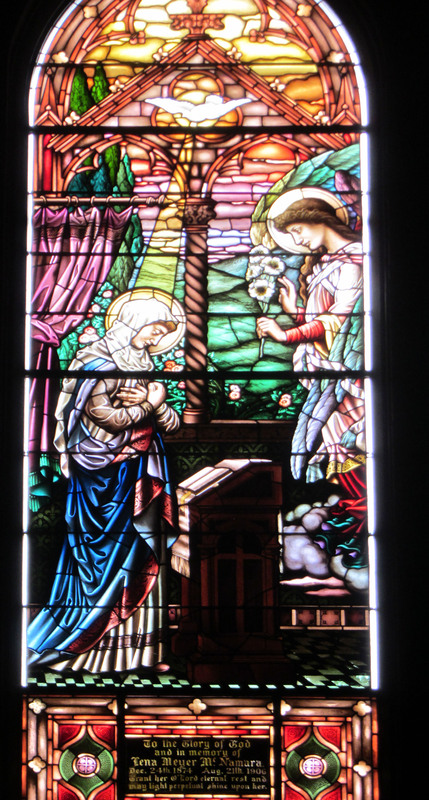 Designed by his wife, Dr. Edith Cookingham Emmett, and Father Stewert-Smith. Col. Emmett was a firefighter who was injured in the line of duty and died of his injuries. Given by the Girls Friendly Society in thanksgiving for Hannah Ragan (d. 1910) a supporter of the church’s foreign missionary work. 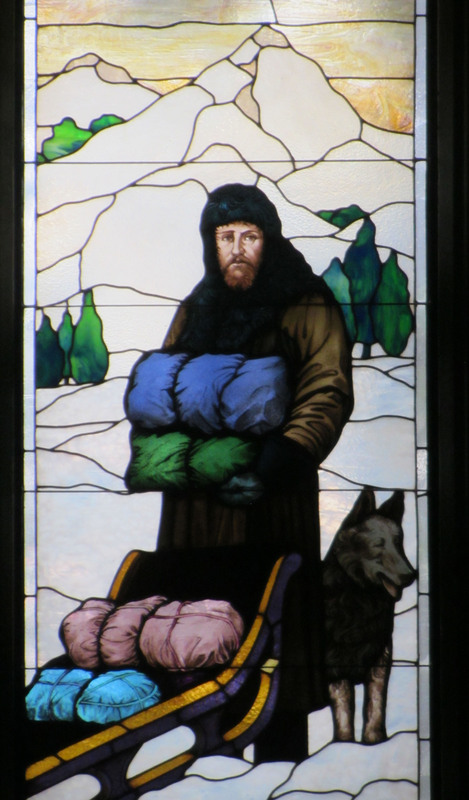 The subject of this window is the Venerable Hudson Stuck who served as Archdeacon to Alaska and the Yukon in the early 20th century. He also participated in the first successful ascent of Mt. McKinley in 1913. Given by Edward Hamill in memory of his mother, Jennie Hammond Hudson, (d. 1883) who led the Order of the Holy Cross established at St. Mary’s in 1880. Given in memory of Mary Webert Martin (d. 1921) who was a nurse by profession. When the city of Memphis was struck by a Yellow Fever epidemic in 1878, more than half of the population fled the city. 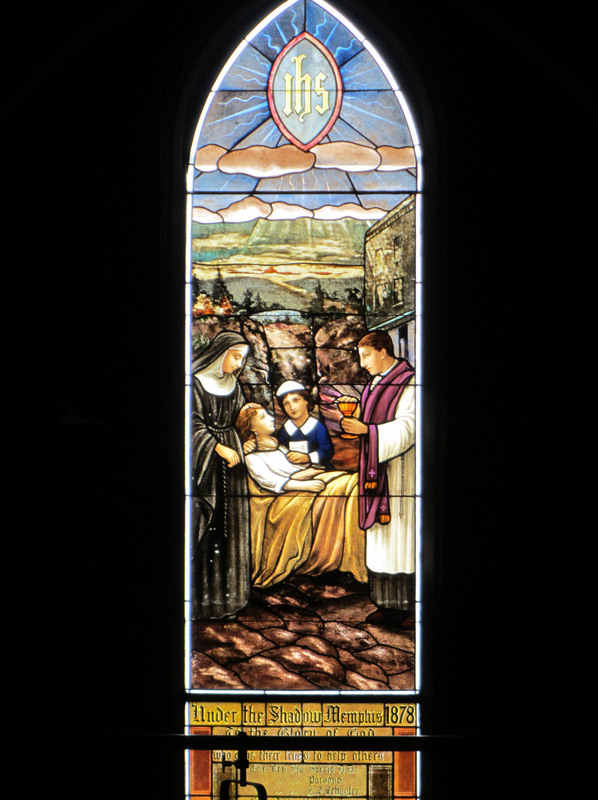 Among those who remained were a group of nuns and priests who stayed to care for the victims. Only 800 of the 21000 who remained in the city survived the epidemic. 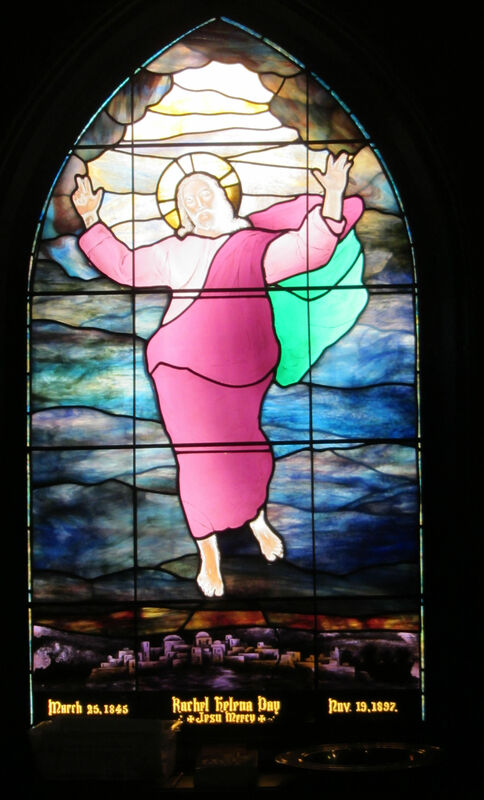 All but one of the group memorialized in this window lost their lives. This widow depicts William Laud, Archbishop of Canterbury under Charles I, leaving his cell in the Tower of London to face his execution in 1645. Stephens and his bride Georgine Huddell Burnell were the first couple to be married in the church in 1888. 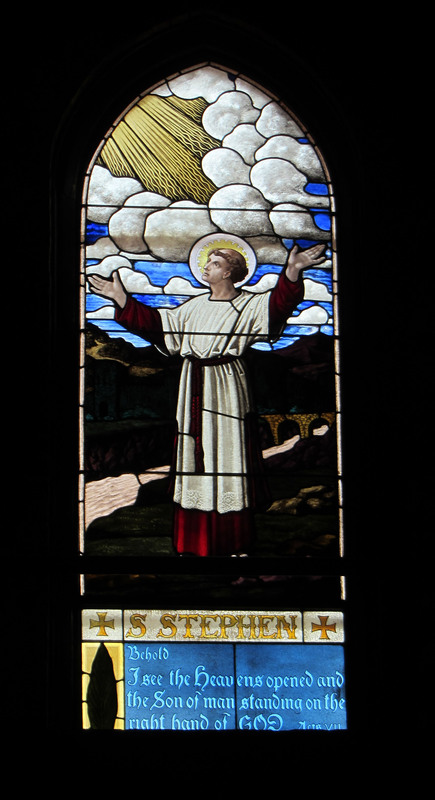 The window depicts St. Stephen, known as the first martyr of the church, immediately prior to his death by stoning. Given in memory of the Reverend George Charles Betts who served as Rector of St. Mary’s from 1872-1876. 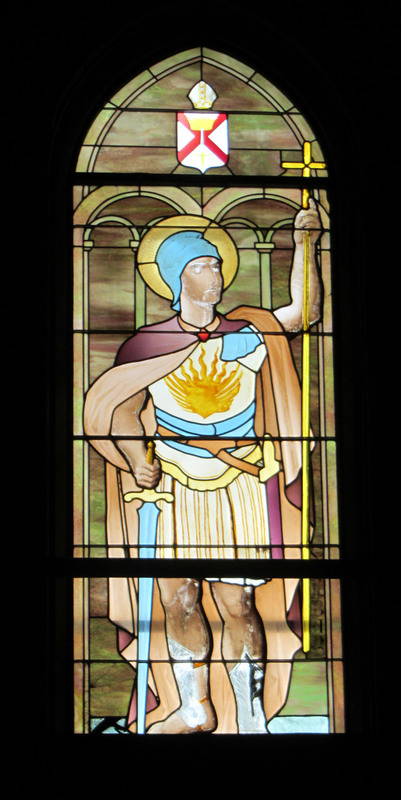 St. Alban was a Briton who converted to Christianity in the late 3rd century. Latin inscription translates “we adore you” and is excerpted from the liturgy of the Stations of the Cross. 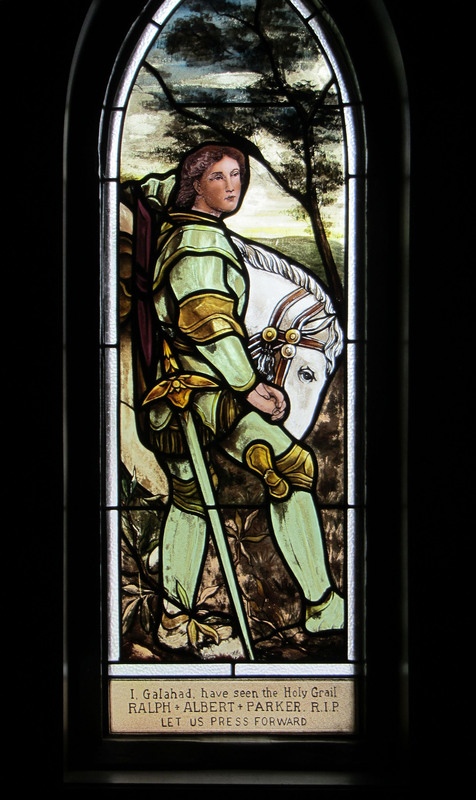 Companion to the St. Michael window. 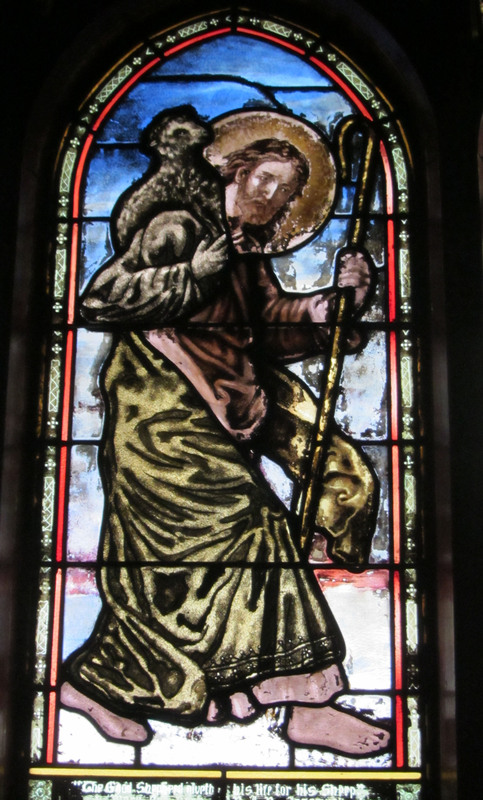 Saints Michael and Gabriel are known traditionally as guardians of the Church. The inscription on the banner translates as Hail Mary full of grace. 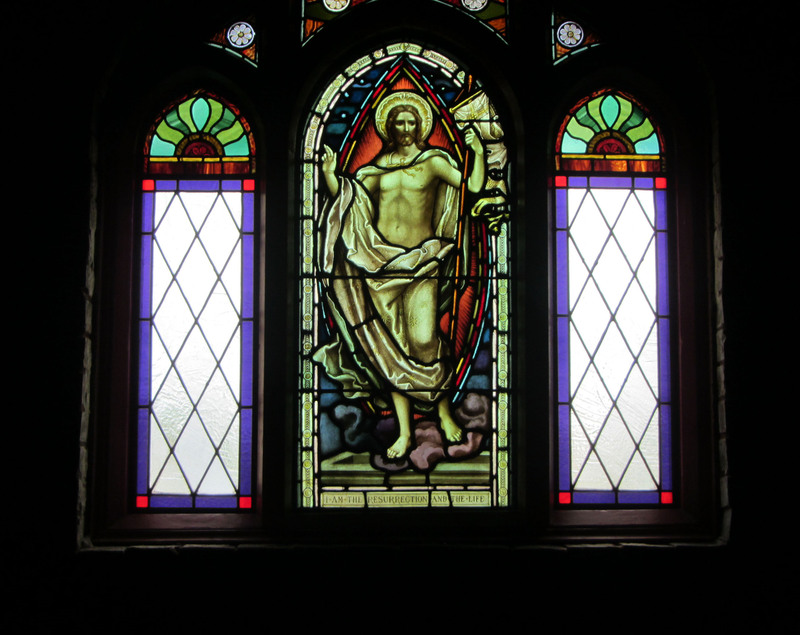 According to a 1920 history of the windows by Pain, these two windows were designed and fabricated in England. Given in 1920 by the Reverend Edwin W. Merrill in memory of his adoptive mother. Given in 1921 as a gift from Father Merrill, who served as Rector of St. Mary’s from 1918-1948 in memory of his dear friend, Ralph Albert Parker. Given by R. L. and Edith Cookingham Emmett in memory of their daughter and only child who died in 1879 at the age of 3. Inscription reads Blessed are the pure in heart. Just a small correction if I may. 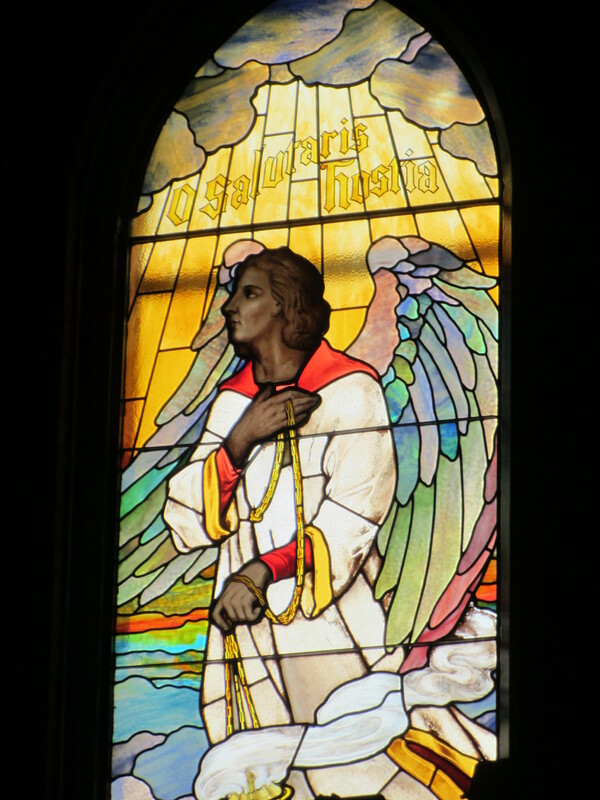 The Angel with Incense window was given in memory of Thomas John Bowyer Pain’s daughter, Lilian Vera, who died aged six. She was not his sister. Thanks so much, Philip. I will make the correction. How do you know about this? Are you in Kansas City? 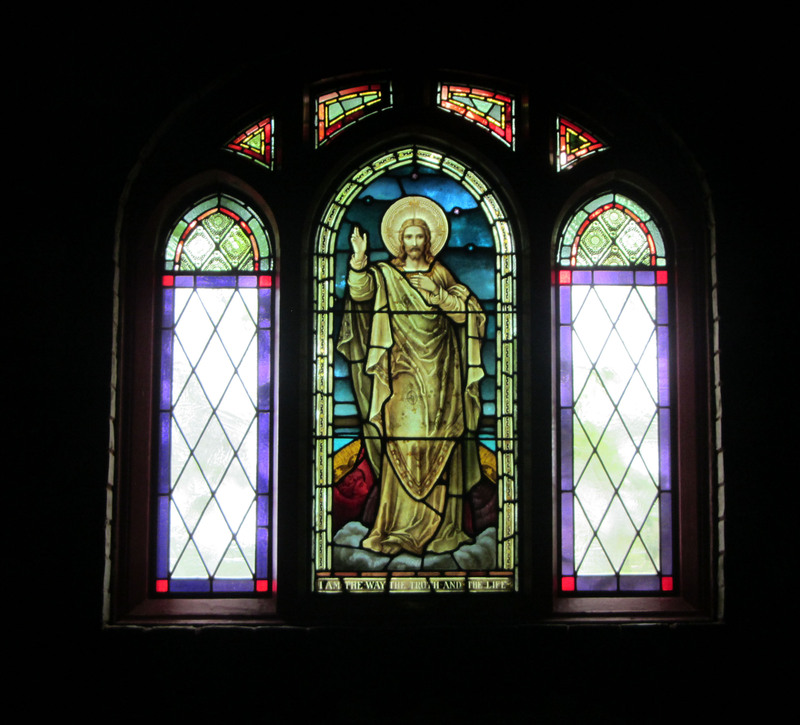 Perhaps we can meet and I can learn more about the windows and the history of St Mary’s.